Farm Bureau Demands County do Nothing to Improve Safety for Bikes on Blanco Rd. : Why Does this Sound Familiar? People who commute or otherwise ride their bikes between Salinas, CSUMB, Marina and the Monterey Peninsula tend to take Blanco Rd. – just as many of the people who drive between Salinas and these locations do. The reason is obvious. It’s the easiest and most direct route. Highway 68 would be a feasible alternative, for those heading straight for Monterey, if it wasn’t for its shoulderless Salinas River bridge – a bridge that forces cyclists to ride in the lane of traffic with trucks and SUVs traveling in excess of 70mph. Which brings us back to Blanco Rd. which, with its wide shoulders, is currently the best cycling route hands down. In fact, it’s hard to travel Blanco Rd. during daylight hours without seeing at least one or two cyclists. Which is why Blanco Rd. was identified, through a multi-year public process, as a top priority for bicycle safety improvements, and why the state awarded a grant to pay for those improvements. Given the stiff competition for scarce state funds, you’d think everyone would be happy to hear we have a chance to bring a few more of our tax dollars home to Monterey County and put them to work. But no. The Farm Bureau sent a last-minute letter opposing the project, not because it would interfere with agriculture – it wouldn’t – but because … well … Blanco Rd. isn’t safe for bikes, you see, so making it safer would actually make people less safe, create liability issues, etc., etc. And the Board of Supervisors, we’re told, is taking this lunacy so seriously that there’s a good chance they may, at their December 6 meeting, decide to reject the state grant of $200,000 (meaning also that the County wouldn’t be reimbursed for the close to $30,000 they’ve already spent planning the project). We’ve commented before on what we think of non-cyclists lecturing cyclists on which roads are or aren’t “safe for bikes,” so we won’t get into that again. Instead, we’ll just pause for a moment to reflect on the fact that the agricultural industry is so powerful in Monterey County that they can usually get their way in a public policy debate even when they tackle an issue that doesn’t involve agriculture, and even, in fact, when the position they take is so palpably stupid and contrary to the public interest that you lose a few IQ points just reading about it. OK. So the Board of Supervisors last month asked representatives of the cycling and ag communities to get together and work out a compromise. A bit of an odd request, since the state grant is for this specific project and must either be accepted or rejected by the end of December. Still, the meeting did take place and, from what we hear, the cycling folks who attended were informed by the ag folks that safety improvements of any kind to Blanco Rd. 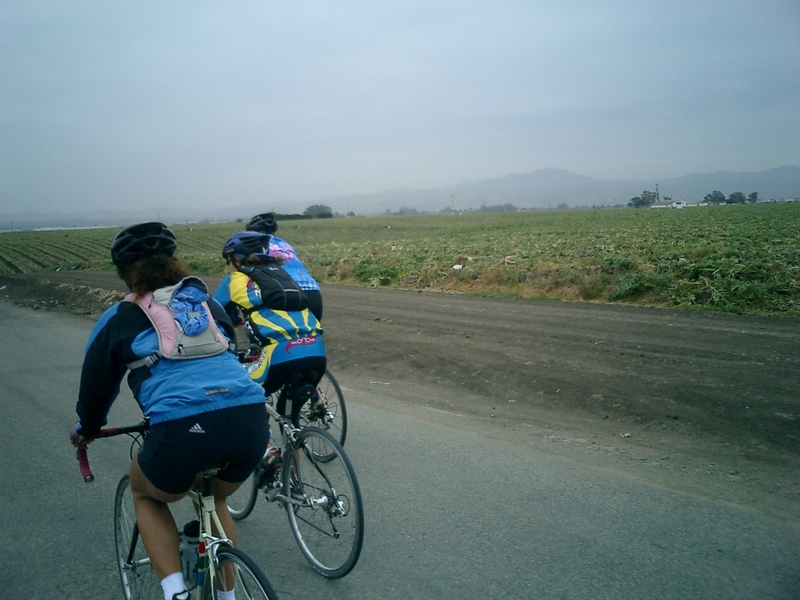 are unacceptable, that cyclists should be required to ride from Salinas to Marina, CSUMB, and Monterey by way of Highway 183 and Castroville; and … wait for it … that Blanco Rd. isn’t just inappropriate for bikes, it’s also inappropriate for cars. So if you commute to and from Salinas by car over this major artery, please be advised that at least some in the ag industry think you too should be required to drive the long way around through Castroville instead. Farmers with property closer to Castroville presumably feel somewhat differently. So the Board of Supervisors, who prior to the Farm Bureau getting involved voted unanimously to support the project, are slated to make a final decision on Tuesday, December 6. One can only imagine how difficult it must be to choose between accepting $200,000 for safety improvements or rejecting the project because … well … ag doesn’t like other people using the public road. Yet $200,000 is chump change compared to the $1.8 Billion the Farm Bureau likely cost the region the last time they had a fit of this kind. That was in 2008, when the Transportation Agency of Monterey County (TAMC) was preparing a measure for the ballot to raise the sales tax by half a cent for 25 years to help pay for county-wide transportation improvements. The sales tax would have raised approximately $1 billion and qualified the county for another $800,000 or so in state funds. TAMC knew that, in order to get the two-thirds vote needed for passage, the measure would have to appeal to practically everyone – environmentalists to developers. Experience in other counties had shown that the more emphasis measures of this type place on funding alternative modes of transportation (bus, rail, bicycle, and pedestrian improvements) the better the chances of passage. So TAMC made sure that about 20% of the funds to be raised were slated for projects of this kind – and one of the more popular projects they proposed to fund was extension of Caltrain service to Salinas. Enter the Farm Bureau. Now the Farm Bureau very much wanted this measure to pass. Getting potholes fixed and congestion eased on the roads they haul their product to market on is important to them. Yet they were apparently unable to understand that the measure needed to appeal to a broad spectrum of county residents. Although Caltrain service to Salinas was a relatively minor item in terms of cost ($1.5 million per year) and wouldn’t really have affected agriculture in any way, the Farm Bureau demanded that TAMC remove it from the measure. Why? Well, it was something about passenger train service not actually providing a direct benefit to agriculture, combined with vague fears about the train bringing people into the area who might be less friendly to agriculture than the current residents. Really. When TAMC complied with the Farm Bureau’s request, we predicted here on Xasáuan Today that, by irritating environmentalists and train buffs, they had just destroyed their chances of getting the measure passed. And, in fact, the narrow margin by which the measure was defeated (it got 62.11% of the vote) does strongly suggest that it would have passed if not for the Farm Bureau’s ham-handed and self-defeating elimination of rail funding. So these latest shenanigans, sad as they may be, are really nothing new. Just business as usual. Nothing will change, of course, if the Blanco Rd. project is abandoned, other than the County being out some scarce money that the state would otherwise have reimbursed. Cyclists and drivers will go on using Blanco Rd. as is (including the hundreds of out-of-town cyclists who ride it every year as part of the San Francisco to Los Angeles AIDS Ride). And, if a cyclist is someday seriously injured or killed in an accident the safety improvements could have prevented, we don’t think there’s any need to worry that the Farm Bureau will lose any sleep over it. If you support bicycle safety improvements on Blanco Rd., please consider contacting the members of the Monterey County Board of Supervisors prior to Tuesday’s meeting and please consider signing this online petition. This entry was posted on Saturday, December 3rd, 2011 at 9:43 am and is filed under Cycling, Politics, Transportation. You can follow any responses to this entry through the RSS 2.0 feed. You can leave a response, or trackback from your own site. 3 Responses to Farm Bureau Demands County do Nothing to Improve Safety for Bikes on Blanco Rd. : Why Does this Sound Familiar? Great write up! You pretty much nailed it right on the head. debris on the Public Roadway is a Public Safety hazard that is not being enforced to the extent that mud/dirt is often times strewn all the way to the center line. Cyclists are as if the proverbial Canary in the Coal Mine, and indicator species in our transit lifestyle(s), up close and personal with the safety hazards, on the front line, so to speak of, the first user group to be exposed to hazards that the Public is supposed to be protected from. A few days ago I dropped off a petition to build these bike lanes at a Salinas bike shop. As I asked the shop owner for permission to leave the petition in his store, a teenager looked at me and said “Agriculture ruined Monterey County”. Then he rattled off several issues they’ve monkeyed with to the detriment of the rest of us. His knowledge of such things impressed me and I suspect we’ve been denied more by big ag than we’ll ever know. But enough people, including teenagers, know enough and I wonder how long before a coalition of the rest of us puts an end to it. One must always challenge who Farm Bureau is representing. Farm Bureau has two classes of membership, voting and non-voting and they always claim the total number when they lobby. Membership is awarded through purchase of insurance or financial services. Here in MN the largest membership is in Hennepin County, the most densely populated county in the state which includes the city of Minneapolis. Guess what, Minneapolis happens to also have the largest number of Bureau members, all non-voting. I admit, reluctantly I am a rural voting member of the Bureau, farm insurance is difficult to obtain. Always challenge what they say and ask how many voting members they are lobbying for on any issue.